Saujana was built out of the rolling hills of a former oil palm estate. 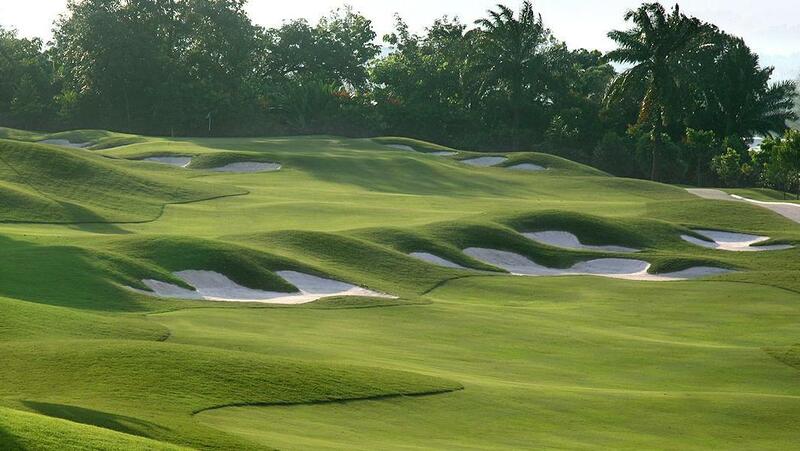 The 2 golf courses, Palm and Bunga Raya are characterized by undulating fairways, mounds, bunkers, ridges, lakes and ponds. Both Saujana courses are equally challenging and maintained n championship conditions year round. The Saujana Palm Course has played host to the prestigious Malaysia Open seven times and was also given the honor to become the first golf course in Asia to host the inaugural European & Asia PGA Tour event. Nicknamed "the Cobra", the Palm Course is widely acknowledged as the toughest in the country with its tight, palm-lined fairways and fast tricky greens. Carved out of a former oil plantation where cobras were introduced to keep the crop-destroying rats at bay, the Cobra was an obvious and fitting nickname. At 7024 yards, the Palm Course is not the longest but what it lacks in length it makes up for in layout. All-round golf skills are a prerequisite to success. The Palm course at Saujana Golf & Country Club has a just reputation for being an exacting test. The sloping greens are fast while the dramatic changes in elevation and undulating fairways are challenging even to professionals. When your shots are not accurate, it is easy to lose them among the rows of palm trees that line the fairways. The front 9 holes are very difficult while the back 9 are easier. Some of the most notable holes include the par-3 2nd. The tee shot over a ravine looks easy at first but actually is very demanding. It is said that it is one of the most difficult holes in Malaysia. The jungle palm trees surround the hole with an OB on the left, a deep ravine in front of the green, and three bunkers guarding the green. The green is highly undulating with a strong mound, so 3 putts or 4 putts are common. The following hole is a monster 605 yard par-5. The tee shot plays downhill where you often come across monkeys. The green is elevated, so the approach shot is difficult. Because the green is double-tiered with the subtle slopes, putting is demanding, too. The green has a magnificent look and feel. The 8th hole is a gentle uphill, strong dogleg to the left with a deep ravine at the turn. The second shot requires a 150 to 200 yard shot from a steep side hill lie. You need to attack the pin with a long iron or rescue wood. If you miss the green to the left on the second shot, there is a steep slope and a deep bunker, which makes saving par almost impossible. Well-trained caddies are available to help with course management and enhance the enjoyment when golfing at Saujana. Facilities are excellent and what you would expect from a world-class golf course. Some on a Malaysia golf vacation opt to stay in the on-site golf resort which saves commute time and commands good views over the golf course.